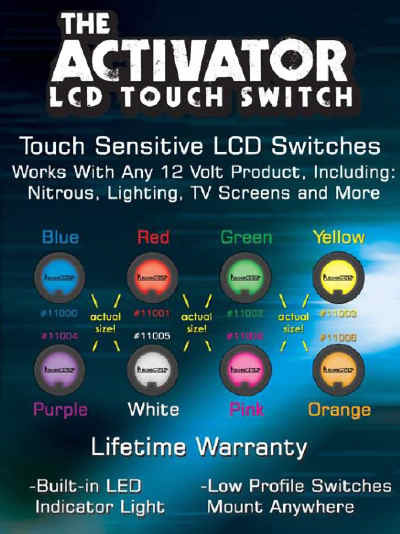 Who needs toggle switches when you can have a LCD touch screen technology switch, that will illuminated in 8 different colors (blue, red, green, yellow, purple, white, pink, and orange). They are small (1 inch in diameter), versatile and would be a great replacement for any of your vehicle switches. They mount almost completely flush with its mounting surface and take only the brush of a finger to activate. All necessary instructions and hardware are included to ensure a smooth installation. LCD Touch Switches are ready to go right out of the box and include the PlasmaGlow Liftime Warranty!